When it comes to cats, we just love them, and want to pet them and want them to love us back, but how to get your cat to like you is not always that simple. In order to get a cat to like us we have to bond with them, and that can take some time, especially if it’s a new cat brought into the home. 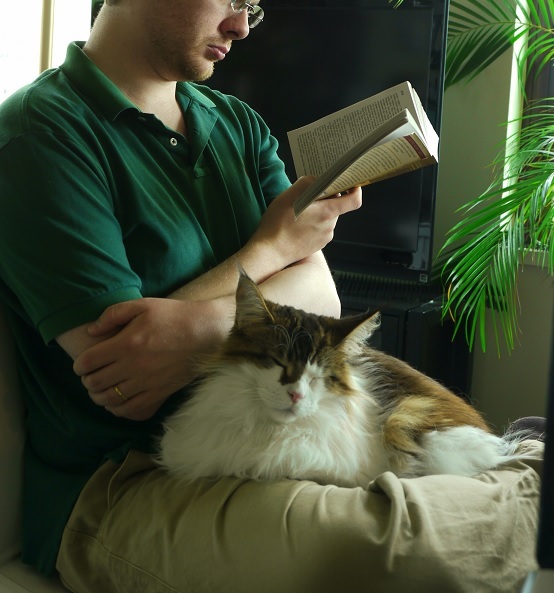 Here we will take a look at some helpful practical tips to help you bond with your cat, and hopefully she or he will return the love over time. Bringing a new cat, or kitten into the home can be stressful for him, because it is something new and he is not feeling secure in a strange place. In order to start creating the bond between the two of you, one must start off trying to make this new addition feel welcome and secure, but how do we do that? First of all, once you have worked out if he will have the run of the house, or he will be limited to particular rooms, make those rooms cat friendly. How To Get Your Cat To Like You. Essential steps that are needed to make him feel safe and secure. Cats are very clean pets and are sensitive too, so always be sure to clean the litter tray every day, or more if needed. Dirty litter boxes can undermine your attempts to bond, because they don’t like a messy litter box, and it can even stress or frighten them into using other places around the home. Purchase a new litter box each time you get a new cat as previous unknown scents can cause stress and anxiety. 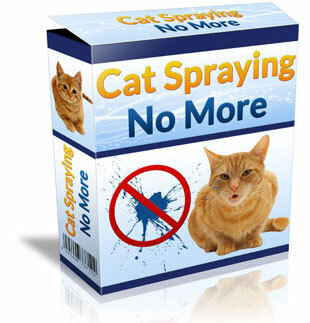 In addition,be sure to get a large enough box for your breed of cat too. Keep in mind, that cats sleep quite a bit, so make sure he has a nice soft comfortable bed to lie in, and maybe place something in there of your own, because this will get him used to your scent. Cats rely on scent, taste, smell and body language, and this is particularly important to realize when bringing home a new cat or kitten. That being said, in humans, it is usually recommended to make eye contact, but with cats this can be seen as a sign of aggression, which is probably why cats seem to be drawn to people who don’t like cats, because they avoid looking at them. Another way to create a lasting bond is with food, be sure to feed him nutritious meals at the same times each day, so that he gets to know when he will be fed, and at the same time start trusting you as his carer. Always be sure to put a clean water bowl out too, especially at feeding times, and wash the food and water bowl regularly, especially if there are other pets in the house. Moreover, don’t be tempted into petting him while he is feeding or drinking, no matter how cute he looks, as this can stress them out and even make them aggressive. Being vocal when feeding time comes can get him used to trusting your voice, call his name every time you put a bowl of food down, and he will be able to associate your calling him with something good that he wants. Similarly, you can use treats from time to time, calling his name, and giving him a treat occasionally will show he can trust you, just don’t overdo it with treats as they can lead to him becoming over weight. However, don’t move towards him, allow him to come to you, and if he doesn’t want to then try again in a half hour until he is curious enough to wander over, then reward him with a treat. 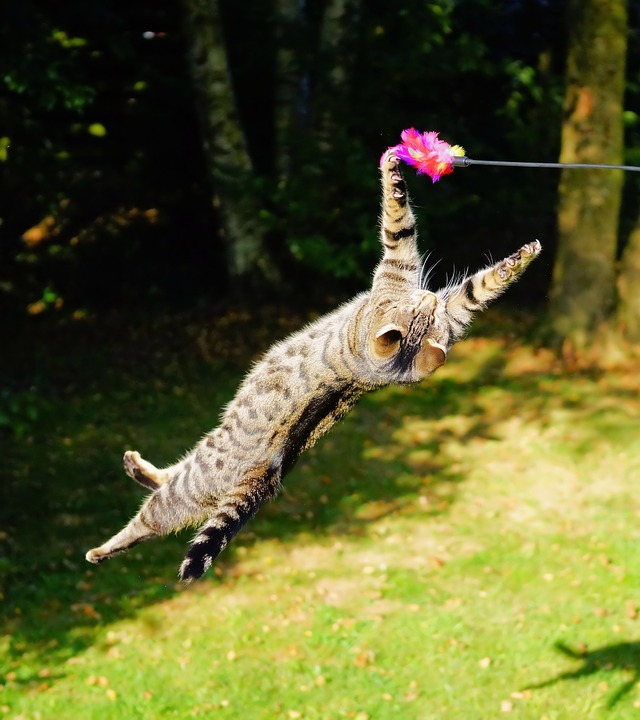 Playtime is especially good for bonding with any pet, and works extremely well with cats providing they are in the mood. Great toys to use are feathers on a line, which involve the two of you, and more often than not they can’t resist once you start moving the feather around, as they will instinctively go after it. Enjoying some playtime together can be rewarding for both of you, but most importantly helps creating further bonding between you and your cat, and soon enough he will come to love you and all the attention you give him. agility has too be seen to be believed! That being said, keeping a routine can be especially helpful for both you and your cat. In addition, feed times at the same time every day, as well as playtime and petting time will enable him to look forward to those times with eagerness, because they are all things he enjoys. Notice at these times his body language, like before feeding, does he rub his body against your legs? If so, then this means he is used to you, and your scent and that your bonding efforts are working. Furthermore, after eating, or playtime he may decide to come to you for some petting, be sure to notice his body language, as cats that wag, or shake their tail aren’t usually happy. Therefore, if he does this try petting him in a different spot, or use less pressure, and see if it makes a difference. Where you position yourself can also make a difference to how your cat feels about approaching you, lying on the floor at his level will often make him feel he can approach without fear, whereas standing tall can frighten him. Sitting by a window where he usually watches birds may invite him to sit on your lap, and give you the chance to pet him while he watches the passing birds. Sitting, or laying on a sofa or bed also presents an opportunity for him to pop up, and lay next to you for some extra petting, because when you are not moving around he will feel it is safe to approach. Once you bring your new cat or kitten home, it won’t take long for bonding to begin, as long as you are making the home comfortable and welcoming for him. 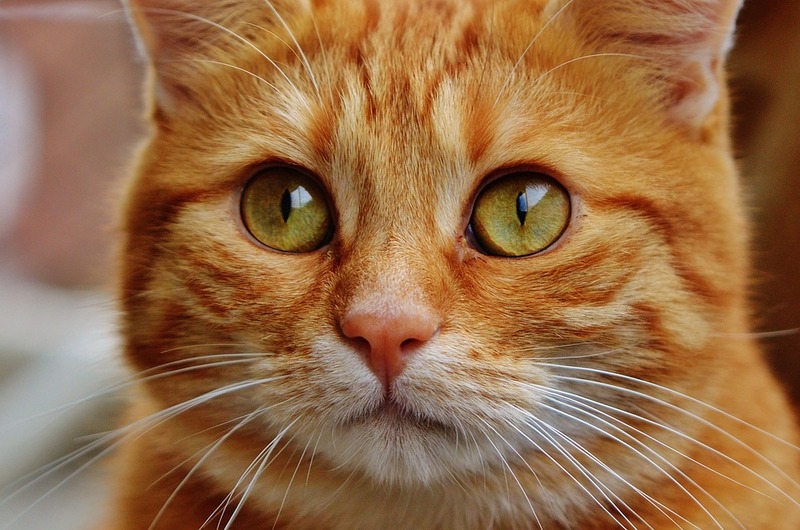 Moreover, follow some, or all of the tips here in this article, and see what works best for you and your new feline friend, and you will be enjoying each others company and bonding in a short time. Always be sure to take your new furry friend to the vet annually for checkups, to keep him healthy and happy, so the bond that you built up between you, and him can last for many long years to come. Hi. Lovely article. I have cats and I never knew cats could feel afraid and stressed out if certain things aren’t in place. I guess they a lot like kids as well. It would be interesting to now if certain breeds have different temperaments? Excellent article. I wasn’t aware that you should buy a new litter box when you get a new cat. Also thought it interesting that it is recommended that you don’t make eye contact with your cat. 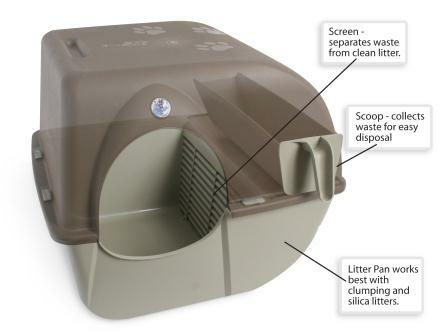 Would you suggest separate litter boxes if you have more than one cat? Currently my neighbor has one litter box that they use for two cats and so far it seems to be working ok. Thanks for the helpful information! I have had several cats in my lifetime and have never had a problem bonding with all of them. I didn;t start out as a cat person, but after I inherited my first one by accident, I came to appreciate and love them. With that being said, I recently adopted a new cat from the pound and am having a harder time than normal creating a bond with her. She is pretty indifferent to me most of the time and I am starting to think it is something I must be doing. These tips seem like a good solution for our bonding problem and I am going to start putting them into practice right away. One question, do you have any advice for helping my 4 year old daughter to bond with our new cat as well? She is dying to have more interaction with her. Cats are so weird sometimes! 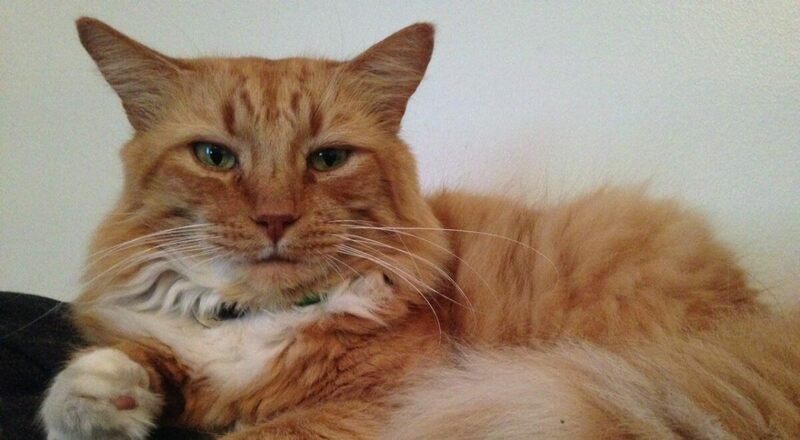 My friend loves cats, but for some strange reason all cats hate her – even my cat, who loves everybody! She has a cat of her own, rescued from a dumpster behind her work. She took the kitty to the vet, got him all checked out, took him home and gave him a really good life, but still every time he sees her he takes a swipe. She’s done everything she can think of, and definitely all of the things you mentioned, but I think he’s just an animal with a bad attitude. 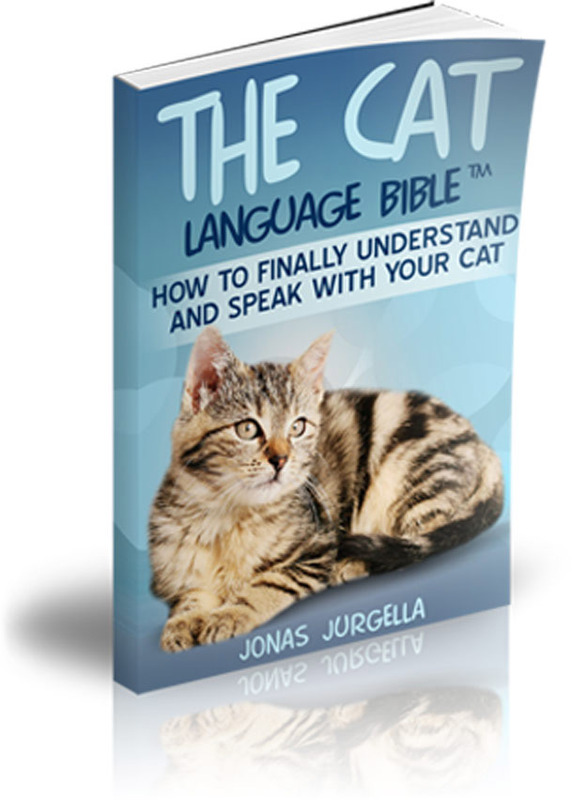 Any tips for particularly difficult cat/human relationships? Thanks!